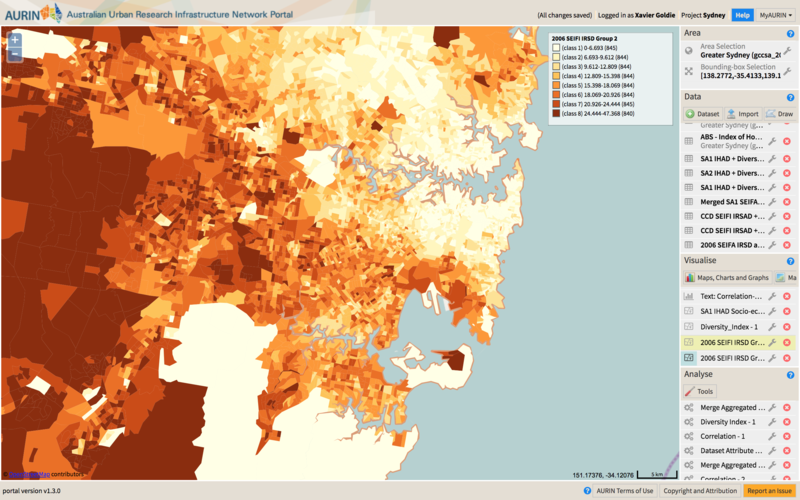 In this tutorial we are going to explore a range of socio-economic indicators that can be used to investigate the distribution of advantage and disadvantage across Australia. There are a range of datasets and indicators which can be used to describe how advantage and disadvantage are distributed spatially, and we will be explore their similarities and differences. 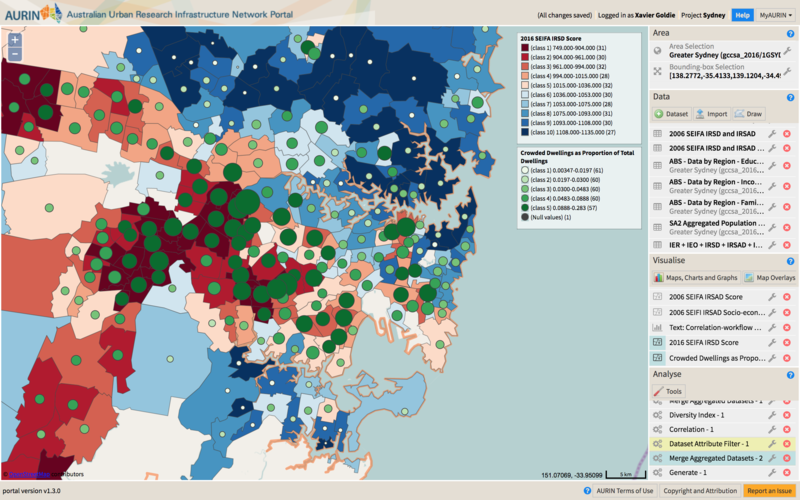 We will also use a range of the tools in the AURIN workbench so that you can become familiar with some of the analytical components of the workbench, in addition to investigating how socio-economic advantage and disadvantage are structured in Australia. The production of these indices is quite involved, so they won’t be described in great detail. Nonetheless, they can be explored further here. 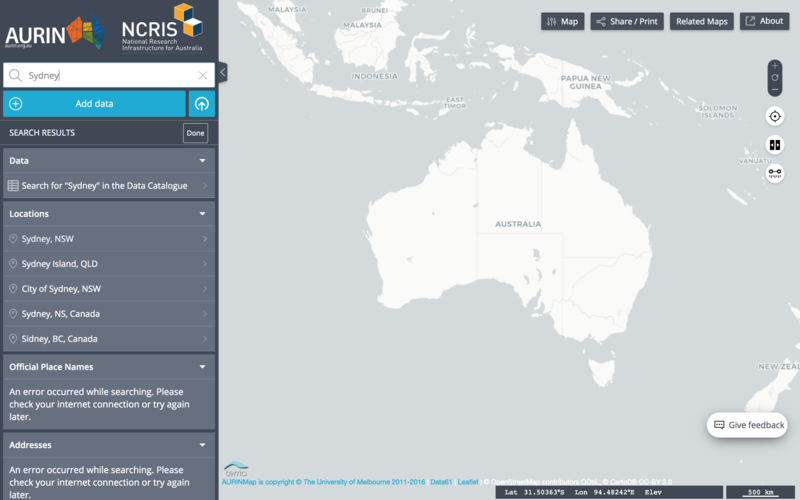 In addition to SEIFA, two other datasets produced by the Australian Bureau of Statistics have been included here. In this analysis, based on 2006 census information, working age individuals are categorised as either advantaged or disadvantaged. Then, for each geographic area, the proportion or percentage of individuals within certain groupings of advantage or disadvantage in that area can be determined. Information on the development of the SEIFI indexes can be found here. In this index, households are categorised as either advantaged or disadvantaged. Then, for each geographic area, the proportion or percentage of households within the quartiles of advantage or disadvantage across Australia in that area can be determined. These experimental indexes are world leading, and highlight the ABS’ leading edge position in the field of understanding the complexity of socio-economic advantage and disadvantage. More information on the work undertaken by the ABS can be read here. In addition to these datasets, we will also include some other important measures. These are described in more detail as they are introduced in the exercises. 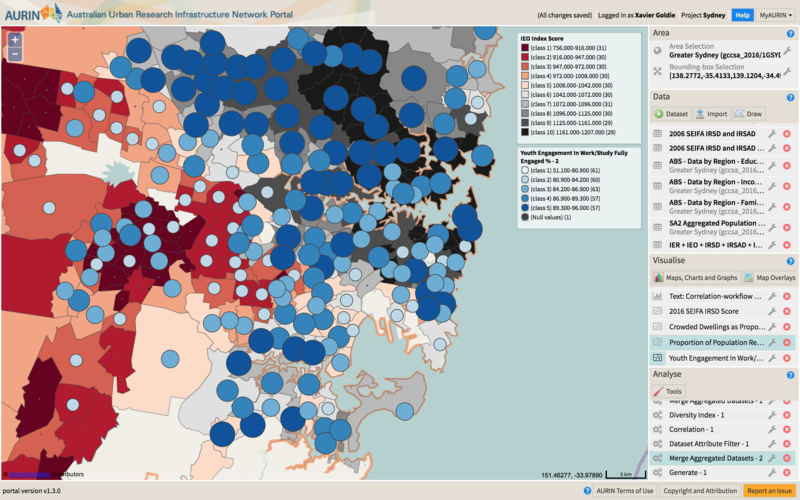 We will be investigating socio-economic indicators as they relate to Greater Sydney. 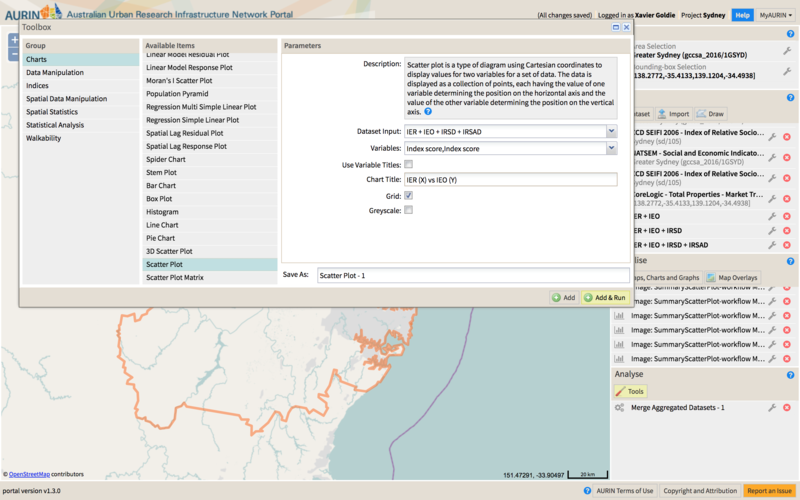 We are going to be bringing in datasets from two different time periods (2006, 2016), which means that our area selection will need to change as we upload the datasets. 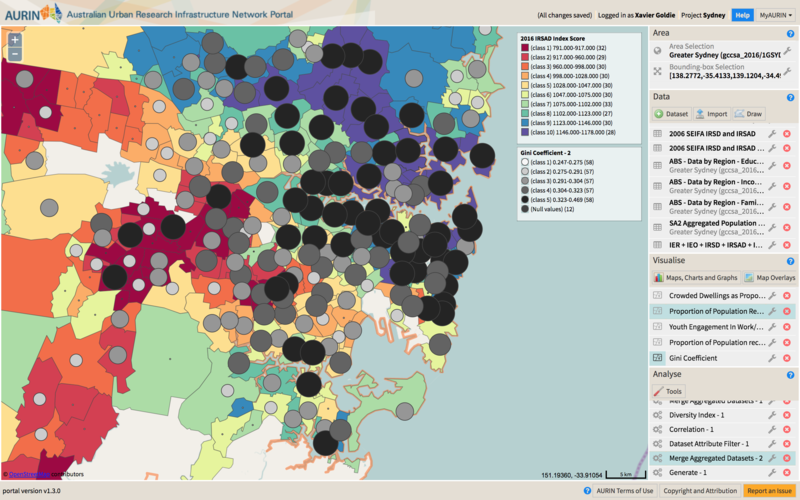 For our 2016 datasets, we will need to select the Greater Sydney Capital City Statistical Area. Housing Suitability Dwellings With Extra Bedrooms Needed No. Selected Government Pensions & Allowances Youth Allowance (Full Time Students/Apprentices) No. Selected Government Pensions & Allowances Age Pension - Centrelink No. Selected Government Pensions & Allowances Disability Support Pension No. 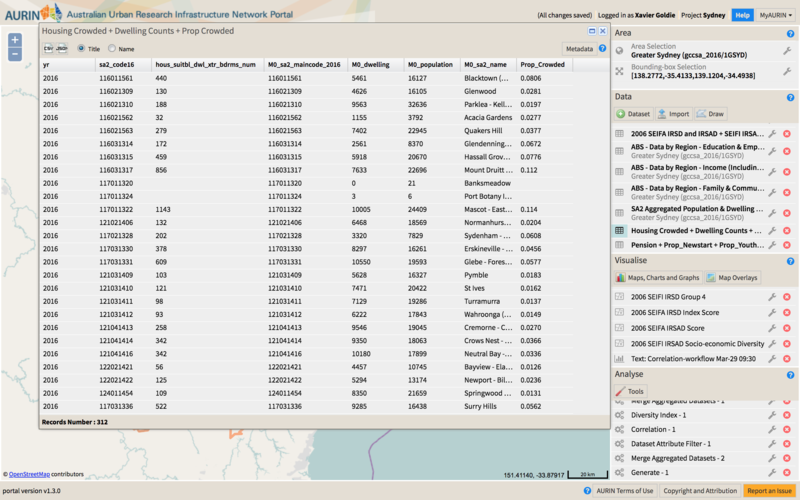 Before you load the 2006 datasets, your portal should look something like the image below. Note the code in the top left of the Area Selection panel. 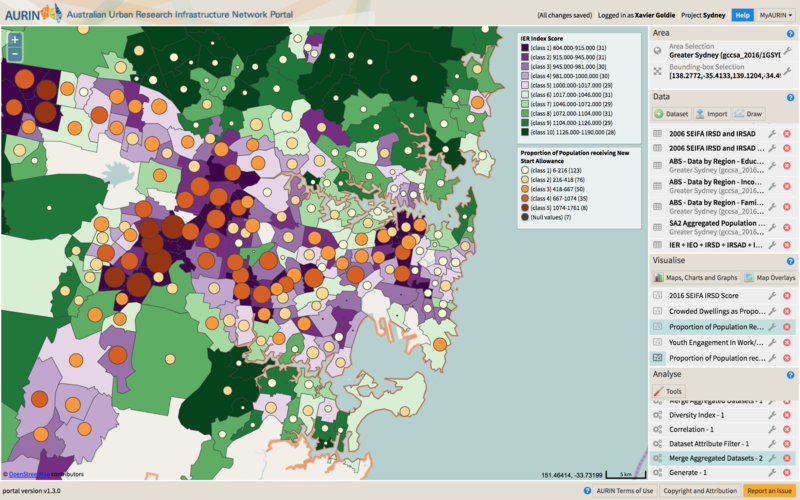 Our first exercise will involve creating Choropleth maps of each of the four SEIFA Indexes at SA2 level across Greater Sydney. 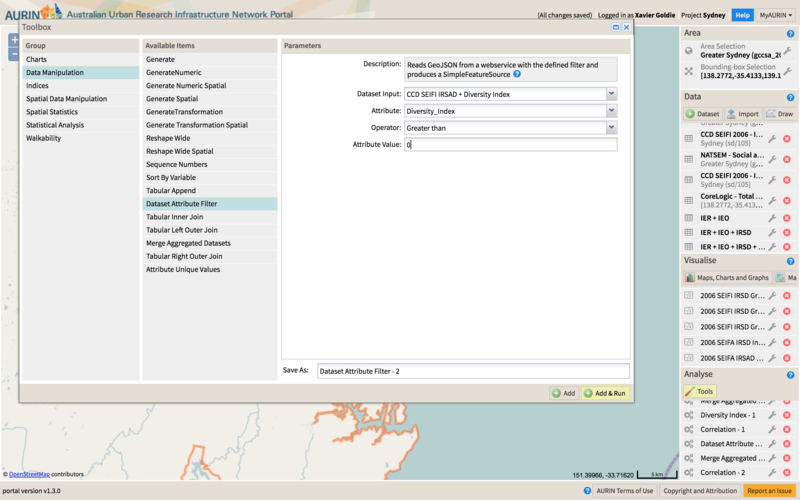 Comprehensive documentation on how to create a choropleth map can be found here. Make sure to choose different colour schemes for each of the maps, but make sure that they match in terms of your number of classes, and the classification method (quantile, natural breaks etc). That way you can tell them apart, and compare them. 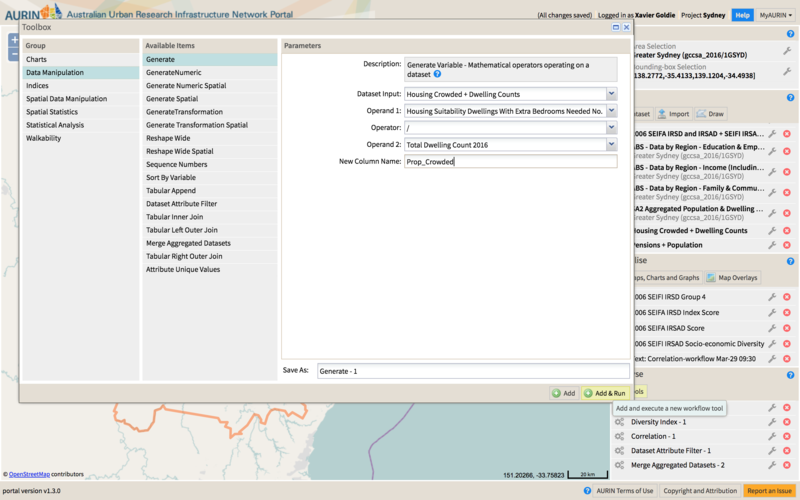 Task 1.1: Create choropleth maps for each of the four SEIFA indexes at SA2 level (IEO, IER, IRSD, IRSAD). Do you notice any overlap in the distribution of index scores? Any differences? 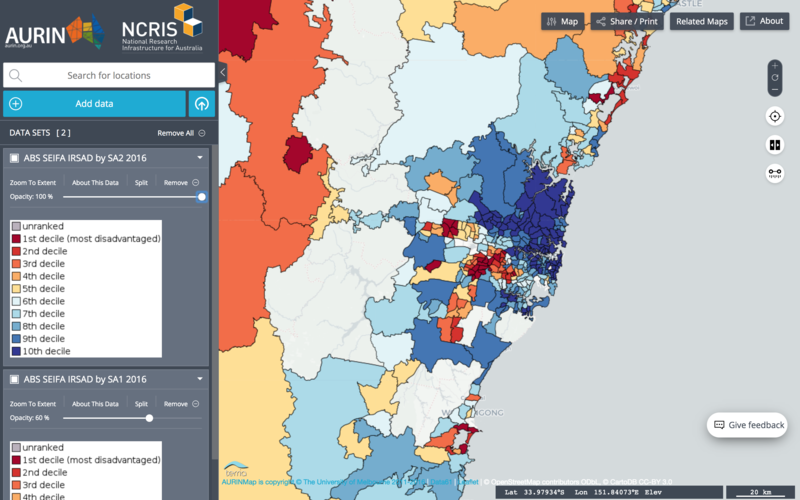 It looks like there might be substantial overlap between these indexes: areas in southern and western Sydney look to have lower index scores for all four indexes, while the north and east appears to have higher index scores for all four indexes. Is there one that stands out that looks slightly different? 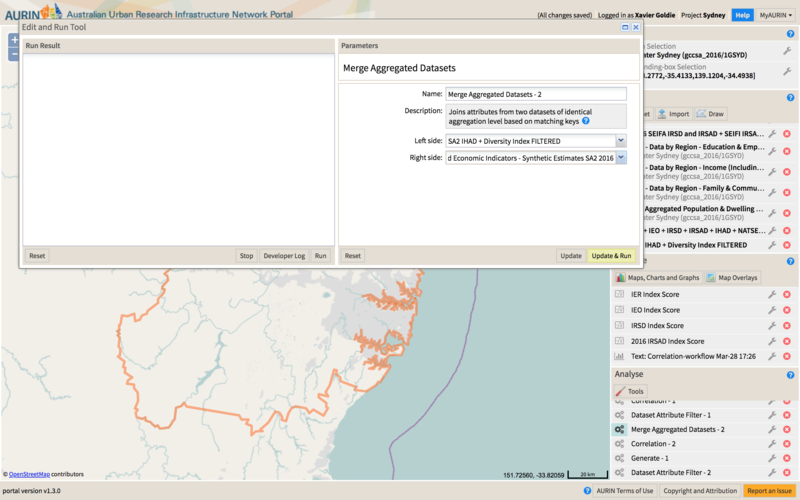 Before we do this however, we need to merge our four datasets together into a single dataset. 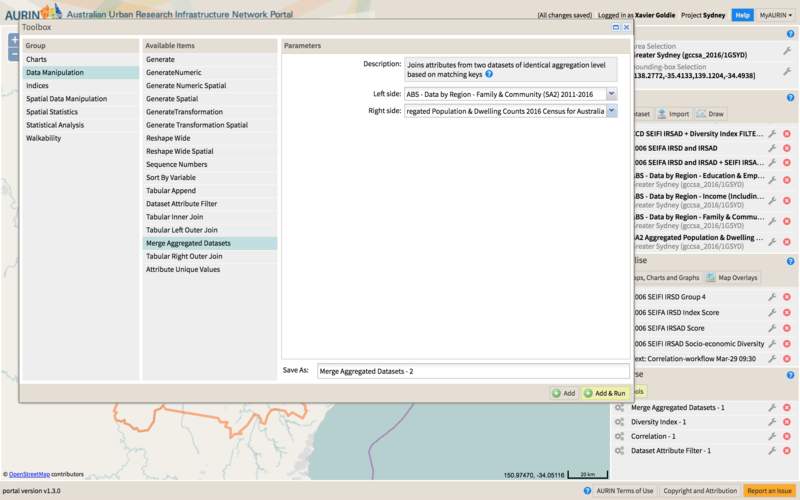 We will use the merge aggregated datasets tool. 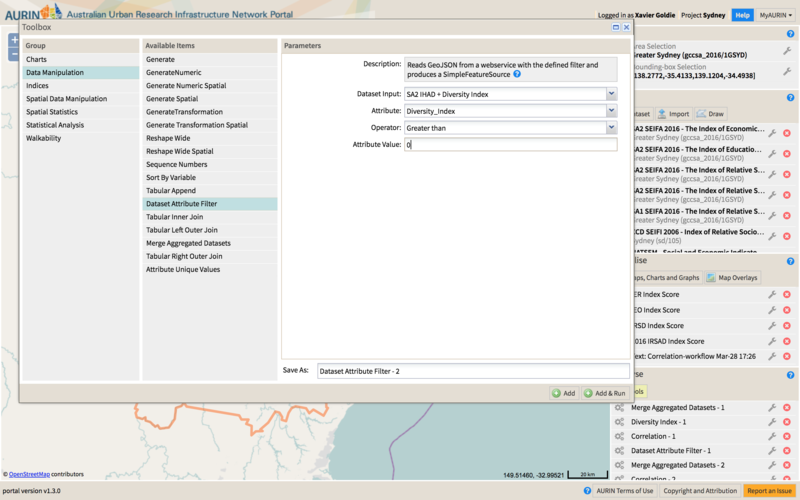 This tool will take two datasets and produce a resultant dataset which has each row (in our case, each SA2) joined, with the variables from the two initial datasets joined. Because we can only join two datasets at a time, we will need to run this tool an additional two times to add all four datasets together. It is important that you rename your datasets in a a way that indicates the order that you join the datasets together. This is because for each of the four datasets, the variable that we want to look at is called Index Score. The first instance is shown below, including the renaming process – you will need to do this a total of three times. Create a static scatterplot of two of your variables. Remember that they will both be called Index Score, so remember which ones you select and put these as X and Y in your Charts! We can see that the strength of the relationship between the indexes varies. In fact, if we can determine the strength of these relationships by running the correlation tool. The outputs of that analysis are shown below. The correlation r values are shown in the bottom left, while the top right has the significance (green = significant, red = non-significant). You can see that all of the indexes are correlated moderately or very strongly, and all significantly. 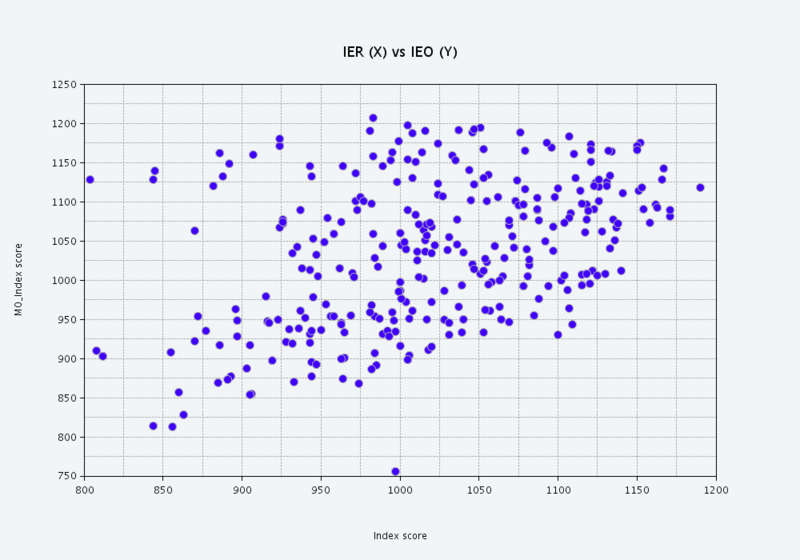 The least associated with the other indexes is the IER. The latter of these is an experimental index which estimates the socio-economic status of individual households, and the groups households into quartiles – Quartile 1 (most disadvantaged), Quartile 2 (middle-disadvantaged), Quartile 3 (middle-advantaged) and Quartile 4 (most advantaged). Neighbourhoods with more than 25% in any of these groups have more than the national average for that particular group. First of all, lets create some choropleths of the four quartiles across Sydney. Remember again to choose the same classifier and number of classes, but choose a different palette for each of the four quartiles. 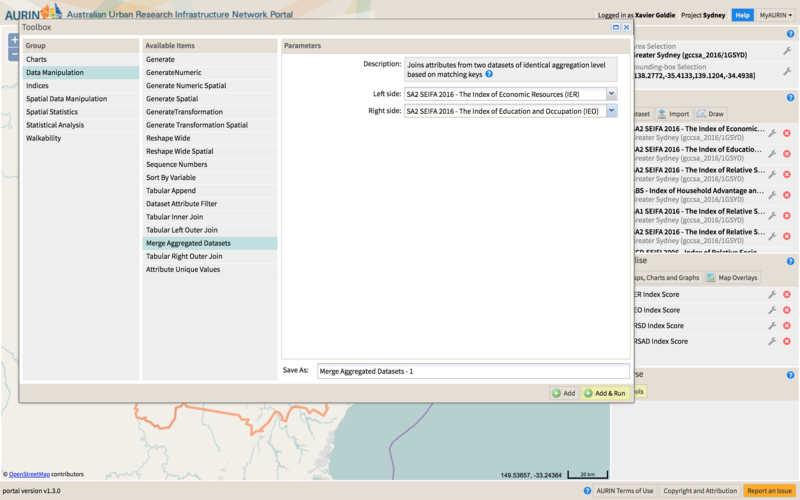 Also create a choropleth of the IRSAD Index Score. 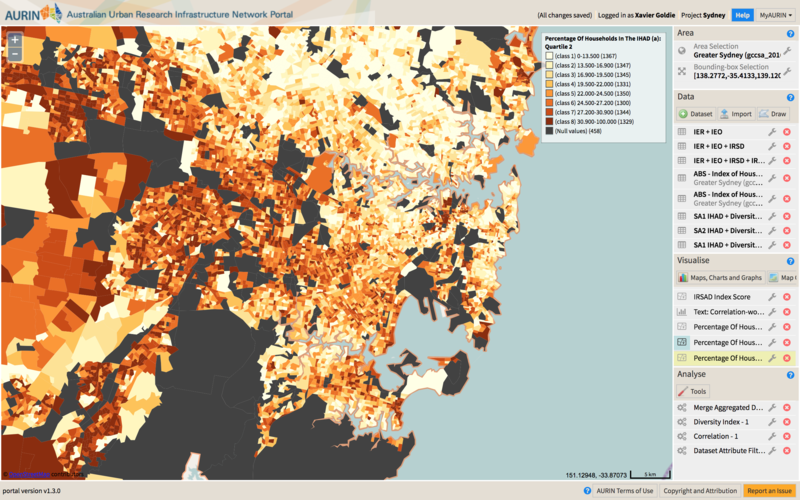 We can see that there are higher proportions of disadvantaged households in the south and west of Sydney, and higher proportions of advantaged households in the north and east of Sydney. Interestingly, while middle-disadvantaged households look to cluster more in the south and the west with most disadvantaged households, there appears to be less of a spatial patterning of middle-advantaged households. 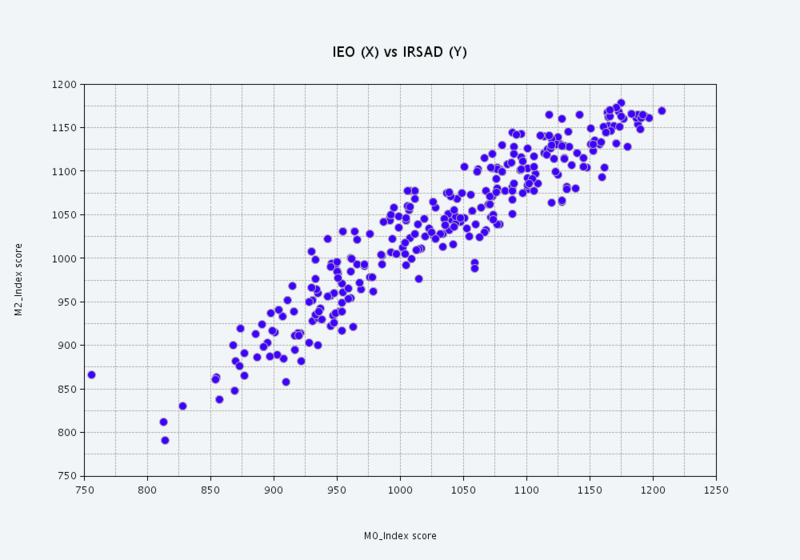 It also appears that IRSAD Scores are spatially associated with advantage and disadvantage. We can test this by first merging our datasets together, and then running a correlation on the variables. 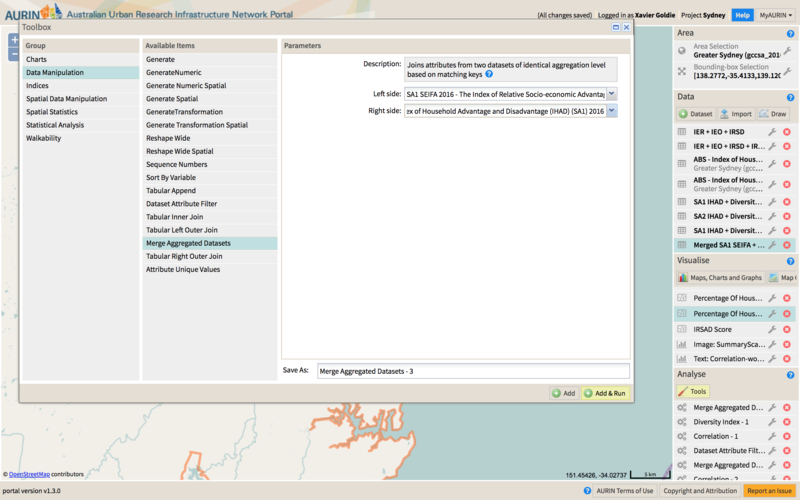 Task 2.2: Merge your SA1 SEIFA IRSAD dataset with your SA1 IHAD dataset. The parameters for this are shown below. Don’t forget to rename your dataset after you’ve created it! The outputs of the correlation analysis are shown below. The bottom left of the table indicates the strength and direction of the relationship (correlation r values), while the top right of the table indicates the statistical significance (green = significant, red = non-significant). We can see that there is a very strong relationship between Quartiles 1 and 4 and the SA1 IRSAD Score, and moderately so for Quartiles 2 and 3. There appears to be a sorting of the dataset between Quartiles 1 and 2 and Quartiles 3 and 4. The quartiles are positively associated with other on their end of the spectrum, although the relationship between Quartiles 1 and 2 is stronger than the relationship between Quartiles 3 and 4. However, there is no significant relationship between the proportions of Quartile 2 and 3. Now we are going to look at the socio-economic diversity within SA1s – we want to identify SA1s where there is a mix of households from the IHAD quartiles. We are going to use the Diversity Index tool. The diversity index ranks areas with a score from 0 to 1, where areas which are more diverse have scores closer to 0 and areas with less diversity are closer to 1. 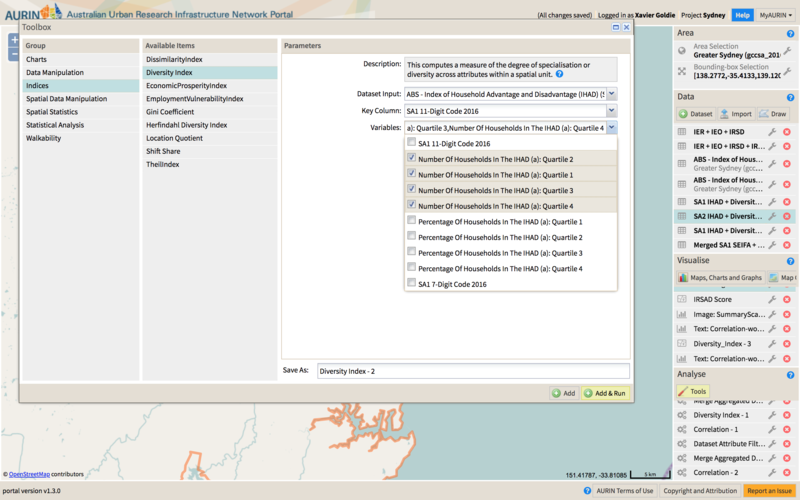 Task 2.3: Run the Diversity Index tool on your original SA1 IHAD dataset, using the number of households in each of the quartiles, rather than the percentages. Remember to rename this dataset! This dataset will contain a number of rows which have a zero value – these are actually SA1s which zero counts. We need to remove these rows. 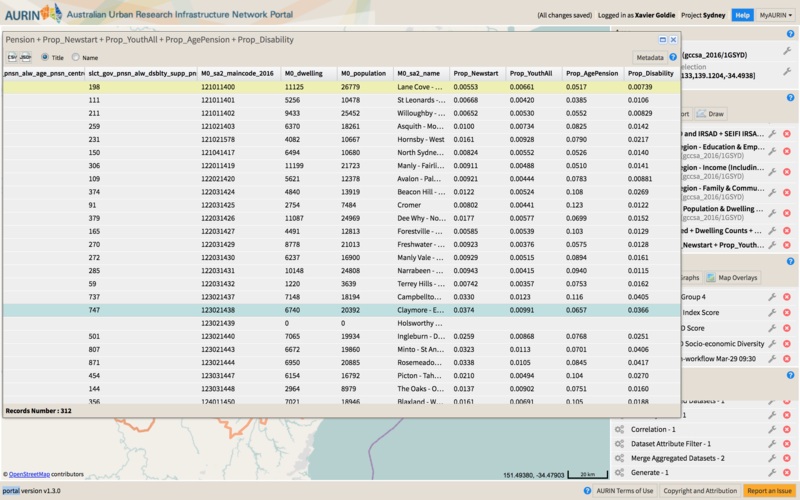 Use the Dataset Attribute Filter tool to only keep rows in this dataset that have a Diversity Index greater than zero. Your resultant choropleth should look something like the map below. You can see that the most socio-economically diverse neighbourhoods occur in some (but not all) of the neighbourhoods the west and in the south, but not in the north or in the east. We can see from this that there is a strong negative relationship between the diversity index and the proportions of Quartile 2 and 3 in an SA1. However, recall that higher values of a diversity index actually mean less diversity. So if the diversity index value decreases with these quartiles, it means that they are correlated with more socio-economic diversity. By contrast, Quartile 4 percentages are moderately positively correlated with the diversity index, meaning that there is less socioeconomic diversity in areas with higher percentages of Quartile 4 households. Quartile 1 percentages had a very weak but still significant positive correlation with the diversity index, meaning that there was less socio-economic diversity in SA1s with higher percentages of Quartile 1 households. The first of these are contained within in a single csv dataset which you can download from here, and will need to be imported into your portal session (the parameters are shown in the screenshots below). The latter two of these is also an experimental index which estimates the socio-economic status of working age individuals. For the SEIFI IRSD, these individuals are grouped into four groups: Group 1 is the most disadvantaged 20% of Australians, Group 2 is the middle disadvantaged 20%, Group 3 is the middle-advantaged 30%, and Group 4 is the most advantaged 30%. For the SEIFI IRSAD, these individuals are grouped into ten groups, each one roughly representing a decile. 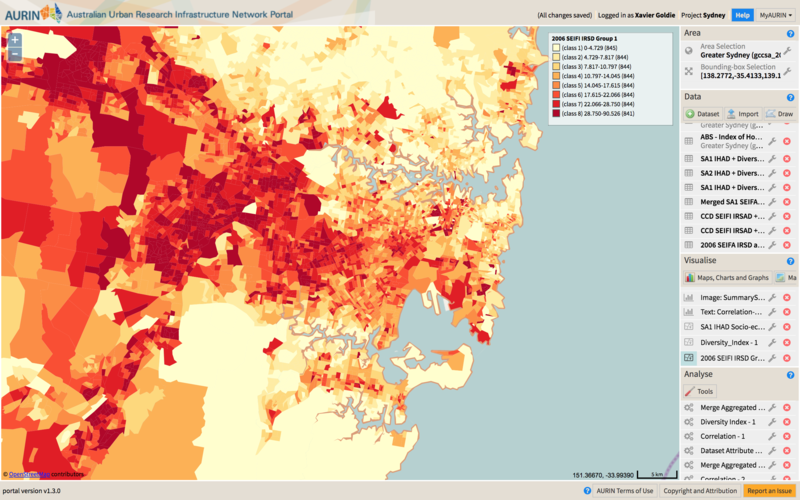 First of all, lets create some choropleths of the four SEIFI IRSD group percentages across Sydney. Remember again to choose the same classifier and number of classes, but choose a different palette for each of the four quartiles. 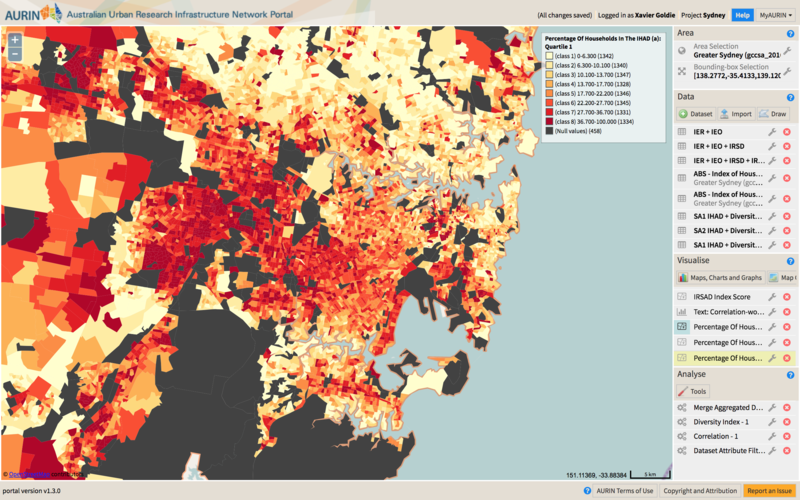 As with our 2016 IHAD maps, we can see that in 2006 there were higher proportions of disadvantaged households in the south and west of Sydney, and higher proportions of advantaged households in the north and east of Sydney. Similar to 2016, middle-disadvantaged households look to cluster more in the south and the west with most disadvantaged households. However, whereas the 2016 IHAD data had much less apparent spatial patterning of the middle-advantaged quartile, group 3 (its 2006 analogue) appears to exhibit a stronger spatial clustering, in particular in the north and south of the metro region. 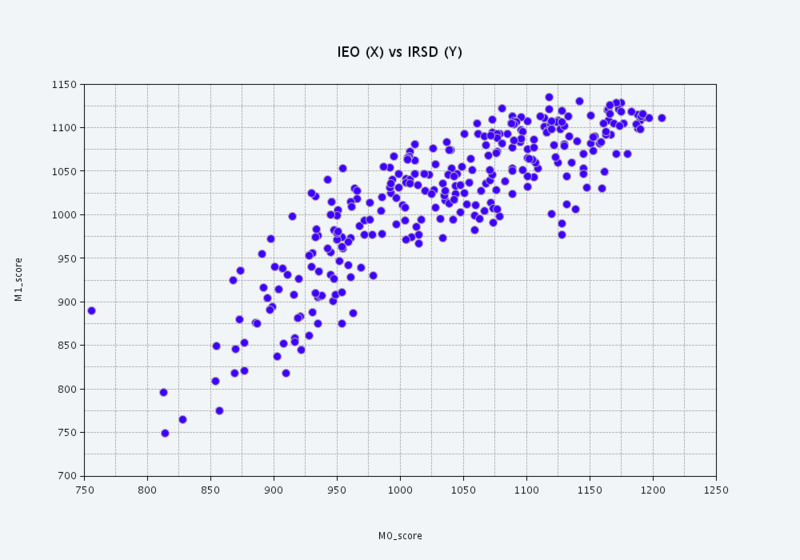 IRSD and IRSAD scores appear to cluster with these patterns of grouping. Now we are going to look at the socio-economic diversity within CCDs – we want to identify SA1s where there is a mix of households from the 10 SEIFI IRSAD groups. Again we are going to use the Diversity Index tool from the exercise above. 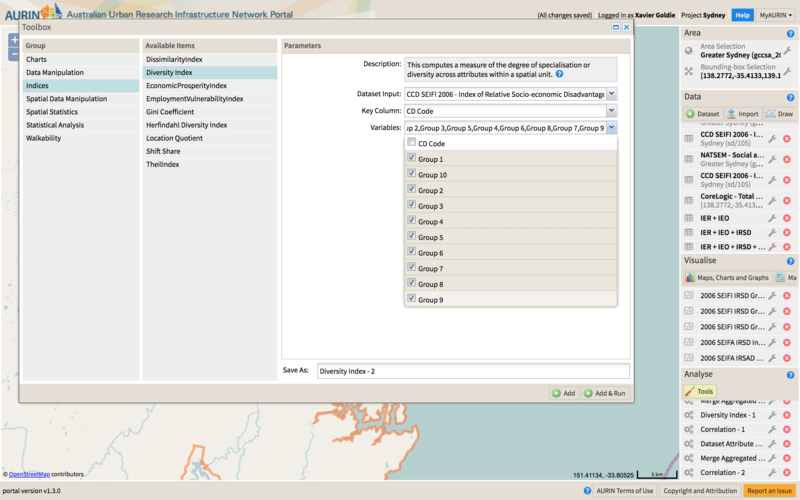 Task 3.2: Run the Diversity Index tool on your CCD SEIFI 10 Groups dataset. These are percentages rather than numbers, but it will have no impact on the results. This dataset will contain a number of rows which have a zero value – these are actually CCDs which zero percentages We need to remove these rows. Use the Dataset Attribute Filter tool to only keep rows in this dataset that have a Diversity Index greater than zero. 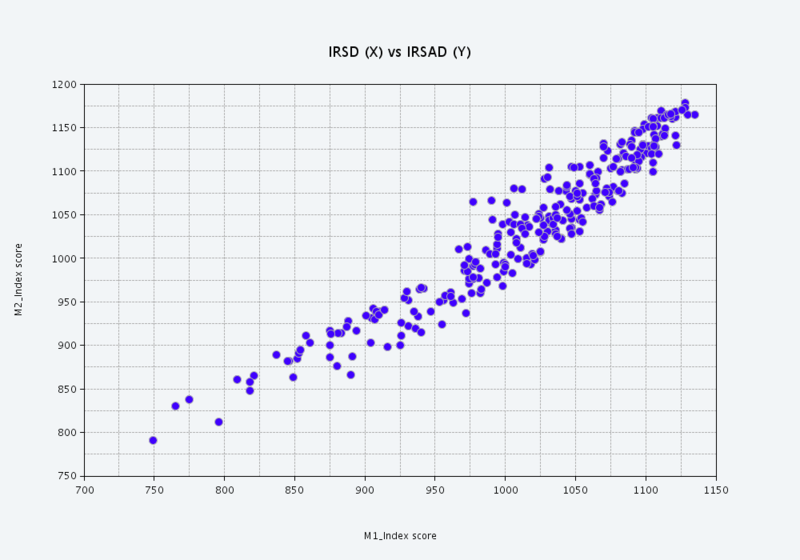 We can see from this that as with the 2016 data, there is a very strong positive correlation between IRSD and IRSAD index scores. There is also a weak positive relationship between the diversity index and the an SEIFA IRSD scores and a moderate positive relationship between the diversity index and SEIFA IRSAD scores. Again, recall that higher values of a diversity index actually mean less diversity. So this means that specifically as socio-economic advantage increases, there is statistically significant drop in socio-economic diversity. As socio-economic disadvantage increases, there is an increase in socio-economic diversity. Now it’s time to turn our attention to the relationship between these socio-economic indexes, and other indicators of socio-economic well being, advantage and disadvantage. 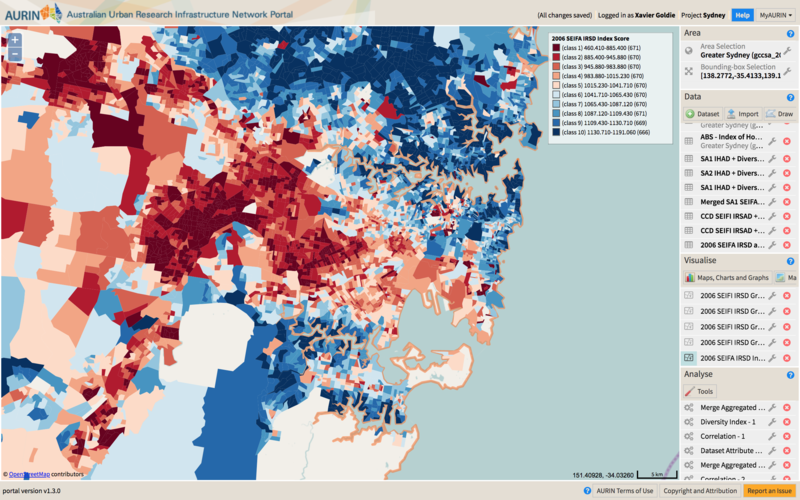 We will shifting back to the SA2 level in Sydney, and combining some of our SEIFA datasets with other datasets. This is where the fundamental value of the AURIN Workbench becomes apparent. 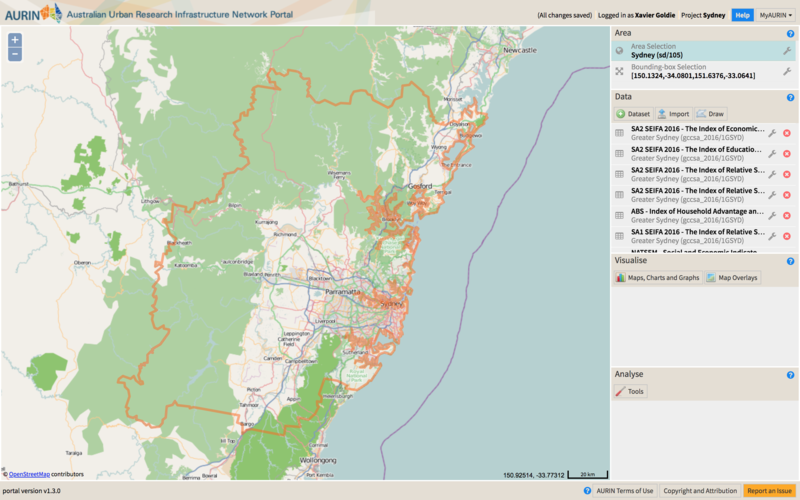 In this analysis we are going to combine datasets from disparate domains along lines of a common geography and start to develop a much richer picture for our understanding of the lived experience of socio-economic status. The variables marked (a) can be found in the NATSEM – Social and Economic Indicators Synthetic Estimates SA2 2016 dataset.The variables marked (b) can be found in the ABS – Data by Region – Education & Employment (SA2) 2011-2017 dataset. 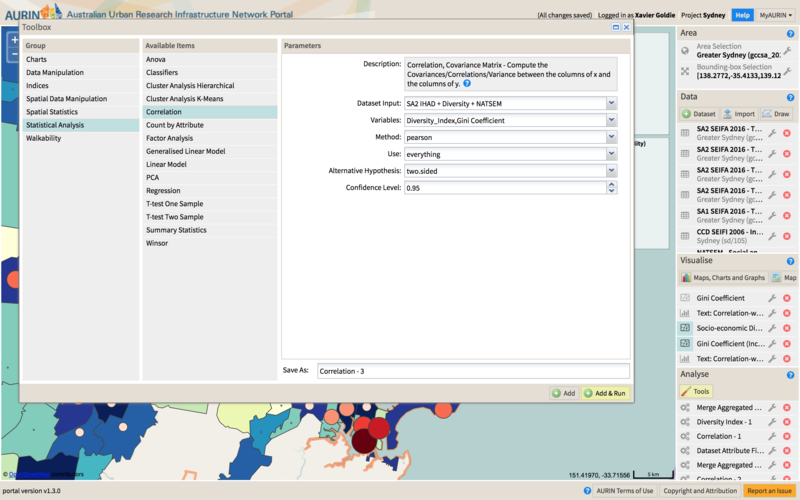 The variables marked (c) can be found in the ABS – Data by Region – Family & Community (SA2) 2011-2016 dataset. 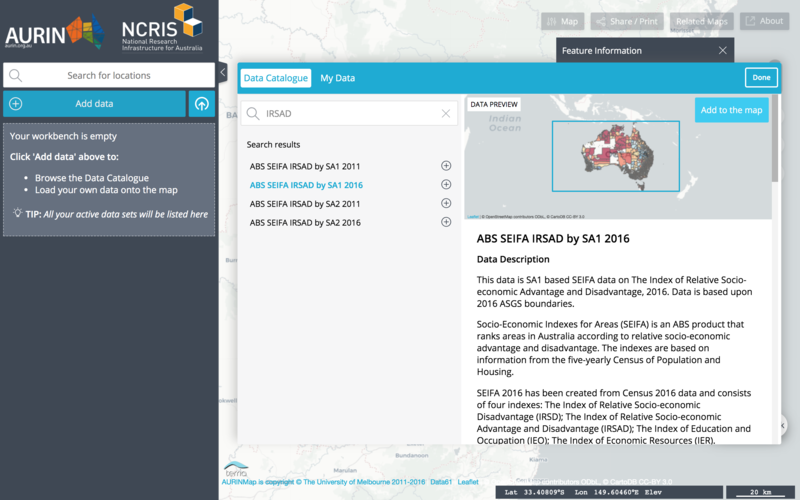 The variables marked (d) can be found in the ABS – Data by Region – Income (Including Government Allowances) (SA2) 2011-2017 dataset, while the variables marked (e) can be found in the SA2 Aggregated Population & Dwelling Counts 2016 Census for Australia dataset. Please note that there is a little bit of data management before we launch into mapping and exploring these variables. Just remember that data processing management is an important part of any analysis, so you should become familiar with it! Firstly, we need to convert some of our counts to proportions, to standardise them for population or dwelling counts. These are the counts marked (c) and (d) above, and they need to be standardised against the counts in (e). Exercise 4.1 First we need to merge our datasets. (2) Merge ABS – Data by Region – Income (Including Government Allowances) (SA2) 2011-2017 with SA2 Aggregated Population & Dwelling Counts 2016 Census for Australia. Remember to rename your output datasets! For the output of (2) above, divide each of the number of different government pensions and allowances by the Total Usual Resident Population (2016) variable. You will need to do this sequentially for each of the variables, so remember to carefully name each output column and dataset! 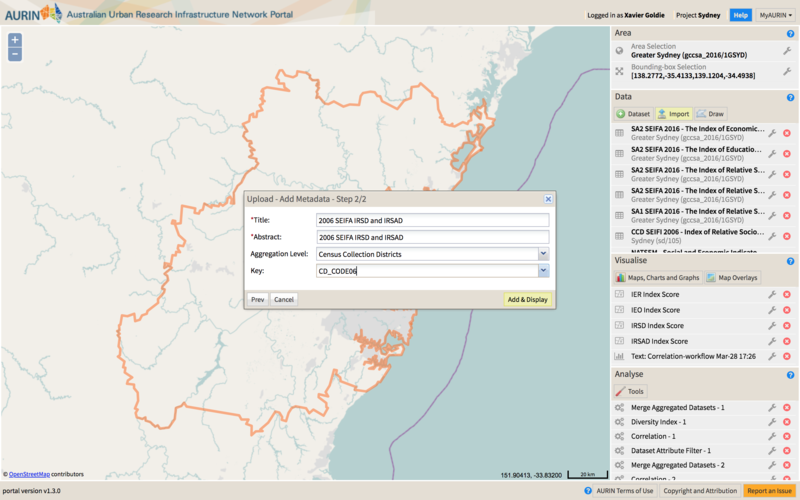 We are now ready to merge all of our datasets together into one large dataset. This will allow us to undertaken correlation analyses, or other statistical analyses. 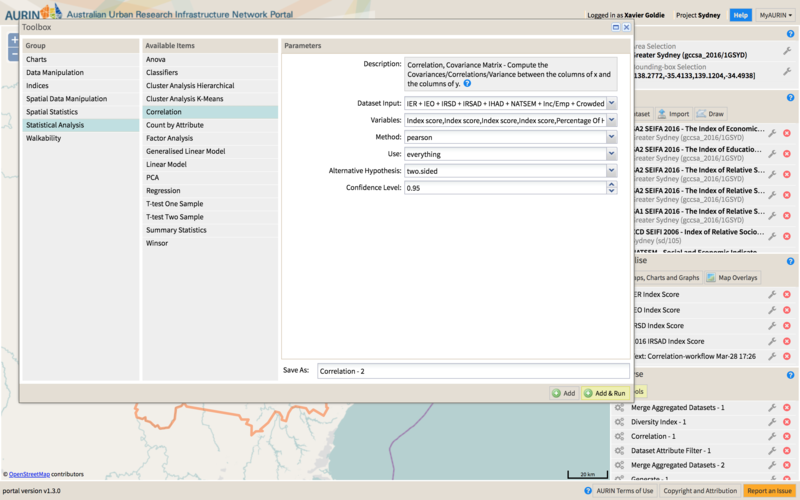 Exercise 4.2: Sequentially merge your SA2 Datasets together – Remember . you already merged all of your SEIFA datasets together in our first exercise, so you don’t need to redo that step. 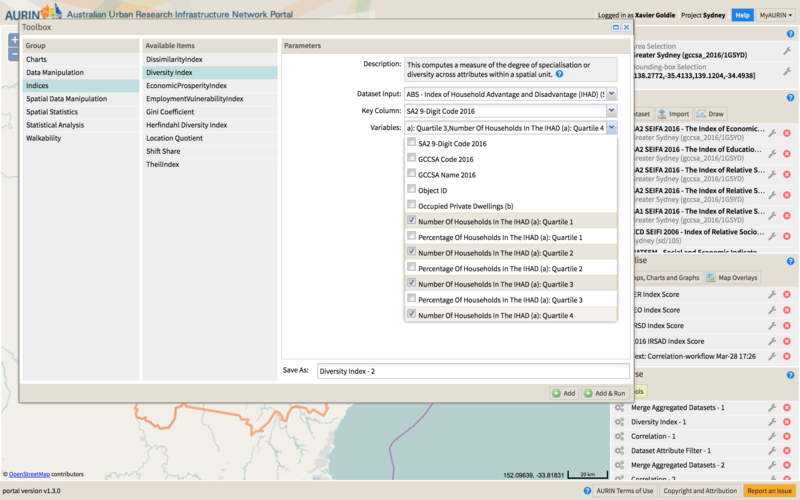 Also, you don’t need to add the Merge ABS – Data by Region – Income (Including Government Allowances) (SA2) 2011-2017 or the Merge ABS – Data by Region – Family & Community (SA2) 2011-2016, or the SA2 Aggregated Population & Dwelling Counts 2016 Census for Australia because you have created new datasets from these – just add your output datasets from above! Once you have created this dataset, you can delete the intermediate datasets to keep your data panel as uncluttered as possible – but make sure you have included all of the variables! Now we are ready to do some mapping! 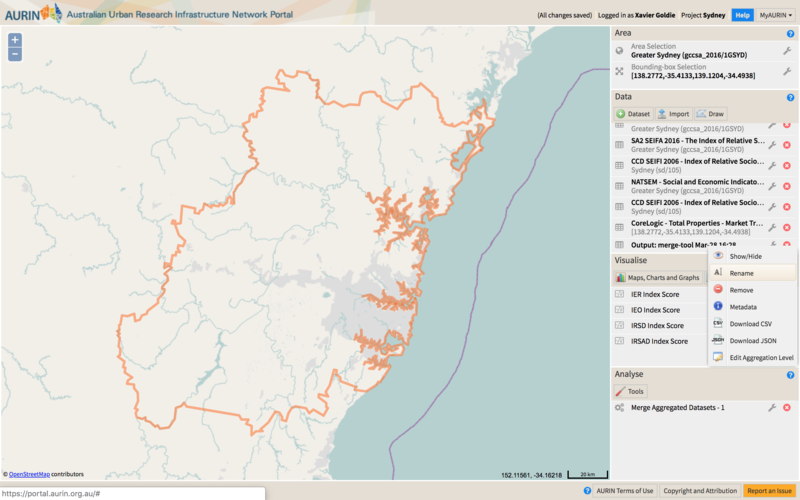 Exercise 4.3: Create some choropleth and choropleth centroid maps of the various variables in the master dataset you have just created. Be creative and insightful – what potential relationships might you pick up? We have created four here, but there are 210 possible combinations of maps! Now we are going to run a correlation analysis on all of our variables – the output is going to be large so it will require some careful, sensible management! Income inequality (Gini coefficient) increases with increasing advantage for all of the SEIFA indexes except the Index of Economic Resources. IHAD Quartile 1 proportions were strongly positively associated with housing stress, unemployment, crowded dwellings, and the proportion of the population on government allowances or pensions. What are relationship can you detect in this table? Are they positive or negative? Strong or weak? Statistically significant? In our penultimate analysis we are going to look at the potential relationship between socio-economic diversity and income inequality. 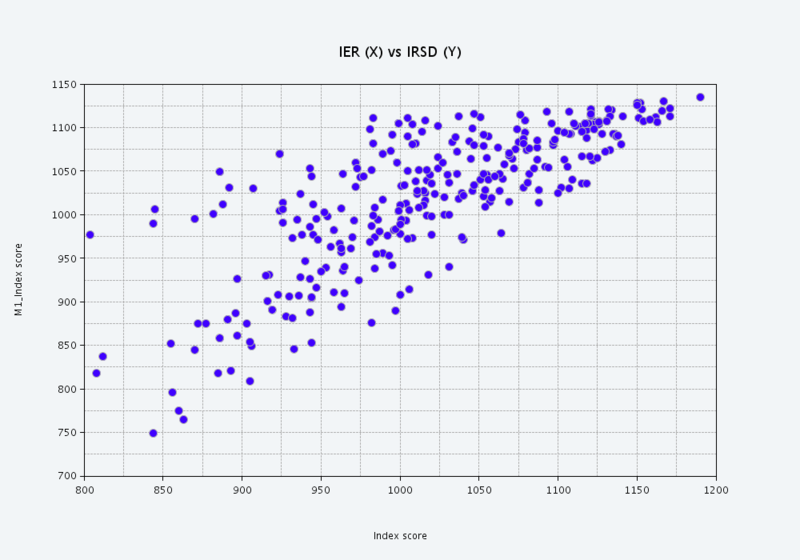 Recall from the last exercise that the Gini coefficient value in our dataset was non significantly associated with the IER, and positively associated with the other three SEIFA indexes (IEO, IRSD, IRSAD). The Gini coefficient is a measure of income inequality, explained in some detail here. As Gini coefficient values increase in value, the amount of inequality in an area increases. This means that as areas become more advantaged and less disadvantaged, it appears that income in equality increases. What we are going to do now is examine the potential relationship between socio-economic diversity and income inequality – are more diverse areas more unequal or equal in terms of income? We will repeat what we did for our analysis of the IHAD and SEIFI at SA1 level for SA2. This means that we need to run the diversity index tool on our SA2 IHAD datasets, and then filter the dataset to remove zero values. Remember that low diversity index values mean higher socio-economic diversity. Once we have filtered the dataset, we need to merge that dataset with our dataset containing the Gini co-efficient data: NATSEM – Social and Economic Indicators Synthetic Estimates SA2 2016. 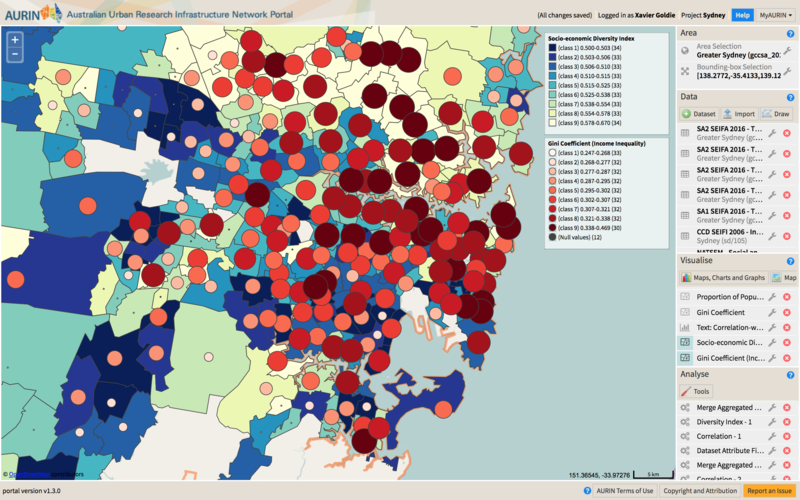 We can then map the values together with a choropleth and choropleth centroid map, and run a correlation analysis. Exercise 5.1: Calculate a Diversity Index for your SA2 IHAD dataset, incorporating the numbers of households in each quartile. Parameters for this are shown below. The last analysis we will undertake is a simple visualisation of the distribution of one of the SEIFA indexes – the IRSAD – at different spatial scales. The SEIFA indexes are calculated independently at each level of aggregation. 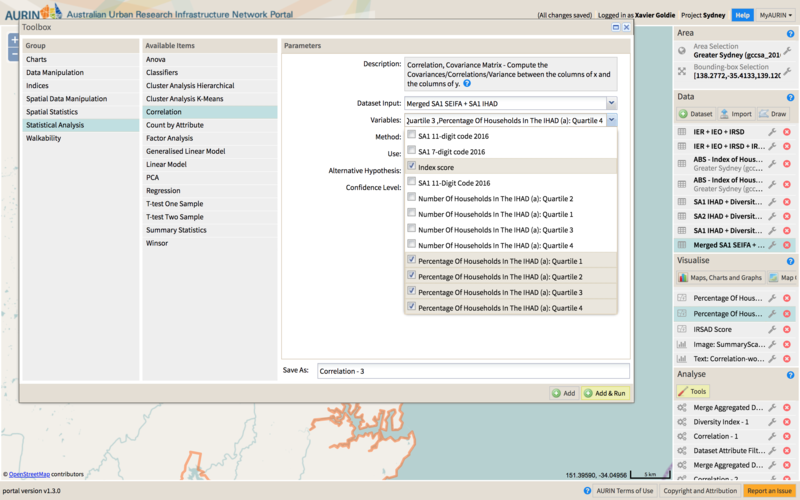 This means that the index score at SA1 or SA1 is dependent on the census responses of all of the individuals within that particular boundary. A consequence of this is that at higher and higher levels of aggregation, more and more variation – spatial and social – is ‘smoothed’ out through averaging. This has consequences on our ability to detect and address pockets of disadvantage that may exist over small spatial scales. To do this zoom to inner suburb, and turn on both the . 2016 SA1 IRSAD and 2016 SA2 IRSAD datasets that you shopped for earlier. Now, using the opacity slider of the top most layer, slide it along and back to make it disappear (shown in the video below). 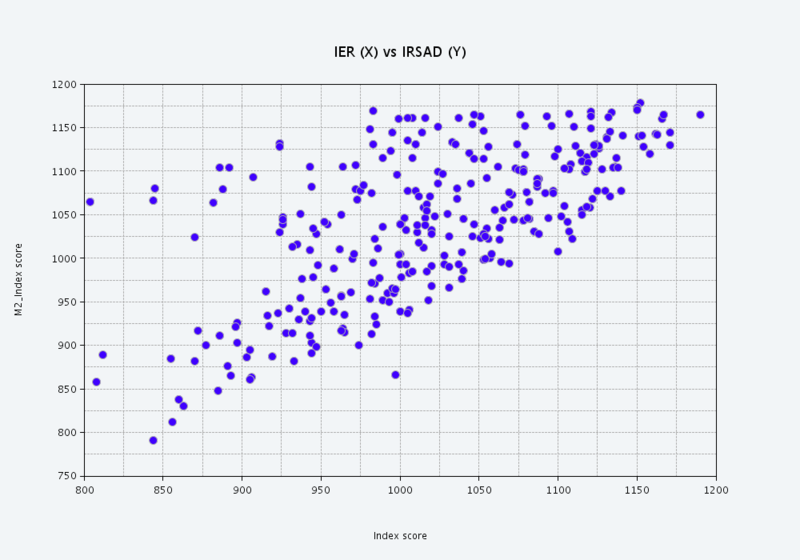 If you click on the SA1s (smaller areas) you will see their IRSAD score (recall that scores lower and lower than 1000 are more and more disadvantaged, while scores higher and higher than 1000 are more and more advantaged. If you click on the north-western red coloured SA1s, you will see that these are quite disadvantaged. In fact, one of them has an index score of 582. This SA1 is ranked 57 out of 57,523 for disadvantage, meaning it is in the bottom 0.1% of SA1s in the country. However, when you aggregate up to SA2, you’ll notice that the area of Waterloo-Beaconsfield has a score of 1079. It is ranked 1793 out of 2310 SA2s for disadvantage (517 out of 2310 SA2s for advantage. This puts it in the top 23% of SA2s for advantage. The information about the stark socio-economic advantage within the suburb is lost when we move from SA1 to SA2. This has consequences for decision making, resource allocation and capital investment. This is an example of the Modifiable Areal Unit Problem.